Ray Emery loved his time with the Philadelphia Flyers. 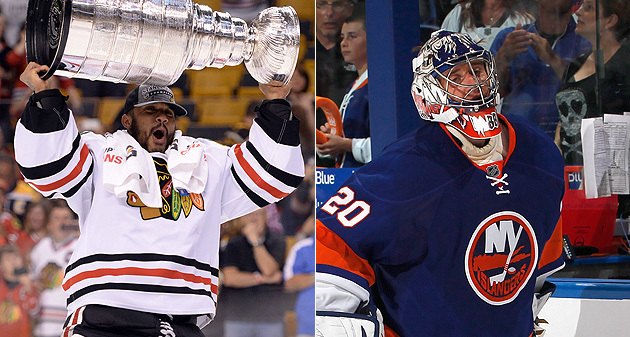 Other teams were interested in his services – the New York Islanders being one of them – but the Chicago Blackhawks goalie knew where he wanted to end up this summer, and it was back in orange and black. Per Pierre LeBrun, Emery signed a one-year deal for $1.65 million with the Flyers. He was a stellar 17-1-0 with a 1.94 GAA for the Blackhawks during their dominating regular season, but didn’t see any time in the Stanley Cup Playoffs due to injury and the strong play of Corey Crawford. So the Flyers go from an Ilya Bryzgalov cap hit of $5.66 million to a tandem of Emery and Steve Mason at a $3.25 million hit. Will they give the Flyers more consistent goaltending than Bryzgalov, or a more expensive replacement, would have? The jury’s out. But this move harkens back to those days when then-GM Bobby Clarke would try to win with goaltending on the cheap, or as an afterthought. There are many reasons why the Flyers haven’t won since 1975. That’s one of them. The Islanders, losing out on Emery, turned back to Evgeni Nabokov for another season and a $3.25 million deal. He was 23-11-7 in 41 starts last season, with just a .910 save percentage, and gave up four or more goals in five of six playoff games against the Pittsburgh Penguins. That said, he was a unsung hero for the Isles in the regular season, giving them consistent performances and never faltering to the point at which the Isles would have to look elsewhere. Which was great, because “elsewhere” meant Kevin Poulin or Rick DiPietro. Nabby turns 38 this month. In the short term, he can help. But one wonders what the ultimate solution for the Islanders will be in goal, as the team transitions to Stanley Cup contention.